Early on this morning, we arrived at the beautiful island of St. Lucia that covers an area of 238 square miles. Due to the profitability of the sugar industry, the ownership of the island has traded over the years between the French, the first discoverers and the British. St. Lucia was named after Saint Lucy, the saint of light by the French. Legend has it that French sailors were shipwreck here on the 13th of December, the feast day of St. Lucy. France and Great Britain continued to contest Saint Lucia until the British secured it in 1814, as part of the Treaty of Paris. Thereafter, Saint Lucia was considered part of the British Windward Islands colony. St. Lucia is now an independent state and a member of the Commonwealth of Nations. St. Lucia is a very mountainous island that is almost entirely volcanic, but also has coral formations along the edges of the island. Our tour guide Nicholas explained that St. Lucia is tropical in nature and as we made our way up the mountain, evidence of the beautiful tropical rain forest was all around us. 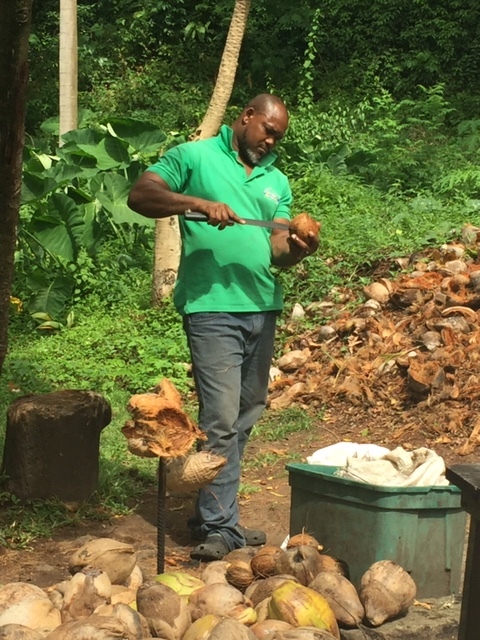 We passed crops of bananas, coconuts, avocados, mangos, breadfruit and coffee. It was truly a tropical paradise. 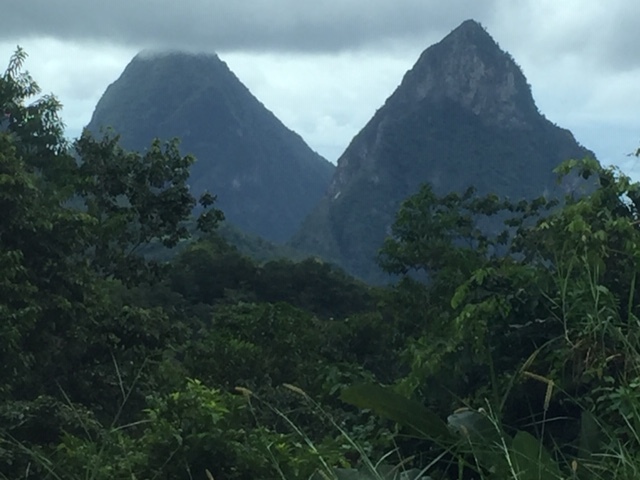 As we entered the town of Soufriere, the Pitons came into view. These are two active mountainous volcano spires. It was an overcast day and the clouds covered the peak of Gros Piton, but Petit Piton was entirely visible. Once in Soufriere, we visited the sulfur springs, which have been a healing haven since the 1600’s. These springs are an UNESCO World Heritage Site and with the rising steam and bubbling mud, we were reminded that we were standing in the rim of an active volcano. 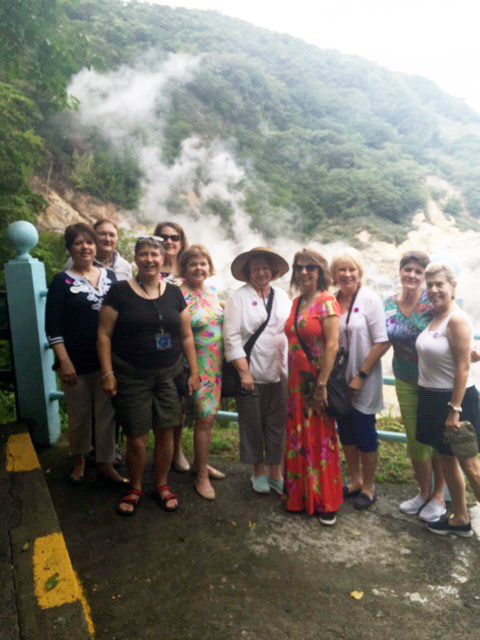 A portion of our group took the strenuous hike up to the viewing platform to get a better look at the sulfur springs. It was truly moving to be reminded of the beauty and power of this remote part of our earth. Next, we visited an old sugar plantation that is no longer in use. Here we learned about the process of harvesting cocoa beans and turning it into chocolate. Inside the cocoa pods, the beans are covered in a white pulp that is sweet to the taste. The beans are taken out, dried in the sun and then crushed by standing on them in an iron kettle. Next, we were given tastes of fresh coconut water and flesh. It was delicious and refreshing. Following our tour, we made our way to a local restaurant where we were served a local “Creole” lunch. As we made our way back down the mountain to our ship, everyone enjoyed the beautiful scenery and were thankful that our driver was able to maneuver the narrow and switchback curves of the road. 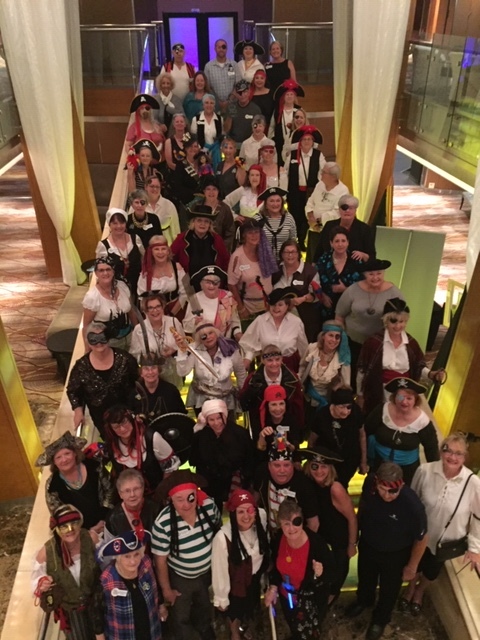 Later that evening on the ship, many heads were turned as DAR members donned their pirate outfits and gathered on the main staircase to have their picture made together. Everyone enjoyed this time together as we posed as the DAR Pirates of the Caribbean! #TBT 125 years ago, on April 19, 1894, the Sequoia Chapter in San Francisco, California, planted a �... 20 hours 21 min ago.